Packt Publishing recently (December 2010) published a very useful book called the “PHP jQuery Cookbook” by Vijay Joshi. From the very first chapter, you will find the book is quite practical and gets you writing code almost immediately. Which for some, may be a little intimidating but rest assured you can quickly get to grips with it after writing a few more scripts and reading through the explanations, that are clearly and well presented. I like the way the book is structured, it lets you jump into any chapter you like without having to read the previous one, obviously only do this if you are comfortable with the basics. 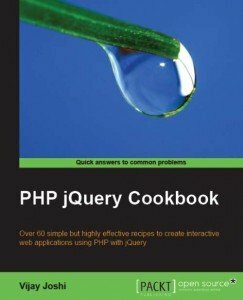 The book starts off explaining how to handle events in jQuery and swiftly moves on to more advanced topics like saving and retrieving data to files and databases with the use of PHP, XML / JSON, and all the way and not limited to, creating your own simple ajaxed shopping cart! Another useful script that stood out, is the auto-complete / auto-suggest feature. We have seen these everywhere now, and here you will learn how to create it from scratch, including the use of keyboard navigation of the results list. Both the ebook and printed version are available at Packt Publishing or just the print version is also available from Amazon. We will update this post with information of the winner, who will be chosen at random from all the comments and tweets at the end of the month (31st Jan 2011).